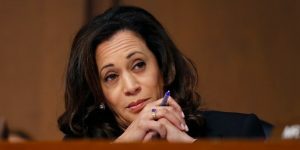 Democratic California Senator Kamala Harris began her questioning of James Comey the former director of the FBI on Thursday during his highly anticipated testimony before the Senate Intelligence Committee by using a metaphor about an armed robbery. Throughout Comey’s testimony and in his prepared remarks, the fired FBI director spoke in detail of his conversation with President Donald Trump in February regarding the investigation into meddling by Russia of the 2016 national election and the possible ties to Trump’s campaign. When the two were alone, said Comey, the president said he wanted to talk about the former national security adviser Michael Flynn. The president told Comey that Flynn had not done anything wrong when calling the Russians, but misled Vice President Pence. Trump then said that he hoped Comey could see his way clear to letting it go, to letting Flynn go. During Comey’s Thursday testimony some lawmakers from the GOP attempted to defend Trump by putting an emphasis on the word hope as well as saying that the president did not state explicitly he wanted the FBI director to drop his probe. However, Senator Harris, a former attorney general of California, would not buy that explanation. She said in her years of prosecuting experience when a robber put a gun to someone’s head and then said I hope you give me your wallet, hope was not the most operative world at that instant. Harris also questioned Comey about whether Jeff Sessions the Attorney General had been involved inappropriately in the investigation by the FBI of Russian meddling, though he would not answer the majority of those questions. Comey, when answering many questions during his testimony of three hours, said in an open session he could not answer. Harris has been in the spotlight repeatedly this week including when Chairman of the Senate Intelligence Committee Richard Burr admonished then attempted to silence her during a Wednesday hearing with Rod Rosenstein the Deputy Attorney General. However, the senator from California refused to allow her colleagues to keep her silent and she continued with her questioning, which prompted Senator Elizabeth Warren to tweet her a message of support. Harris has grown in popularity since she took office in the U.S. Senate and rumors have started to swirl about her being a potential candidate for the presidency in 2020.